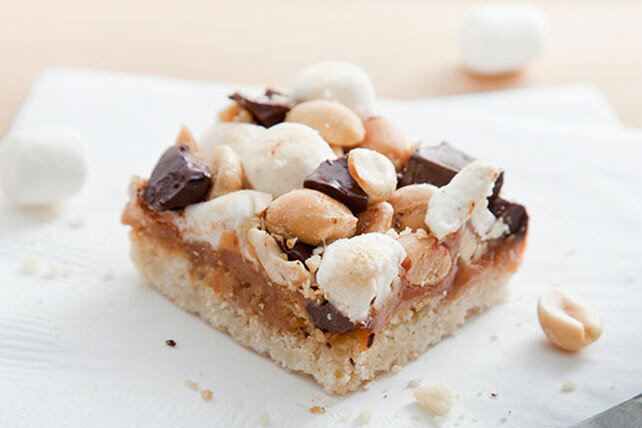 A sugar cookie crust is topped with melted caramels, chocolate chunks, peanuts and marshmallows and baked to gooey blonde brownie perfection. Slice cookie dough; place in single layer on bottom of 13x9-inch pan. Press to completely cover bottom of pan. Bake 15 to 18 min. or until lightly browned. Microwave caramels and water in microwaveable bowl on HIGH 2 to 3 min. or until caramels are completely melted, stirring after each minute; pour over crust. Top with remaining ingredients. Bake 5 to 7 min. or until marshmallows are lightly browned. Cool completely before cutting into bars. Prepare using refrigerated sliceable peanut butter cookies. Substitute 1 cup BAKER'S Semi-Sweet Chocolate Chunks for the chopped chocolate.